In Stanley Kubrick’s 1968 classic, 2001: A Space Odyssey, a race of hyper-intelligent aliens scatters supercomputer monoliths on a number of worlds throughout the known galaxy. The objects are gifts. Evolutionary “kickstarters,” let’s say, built to help young species find their evolutionary footing. In the film, first contact with one of these structures elevates humanity from a race of warring tribal primates into a spacefaring superpower in record time. 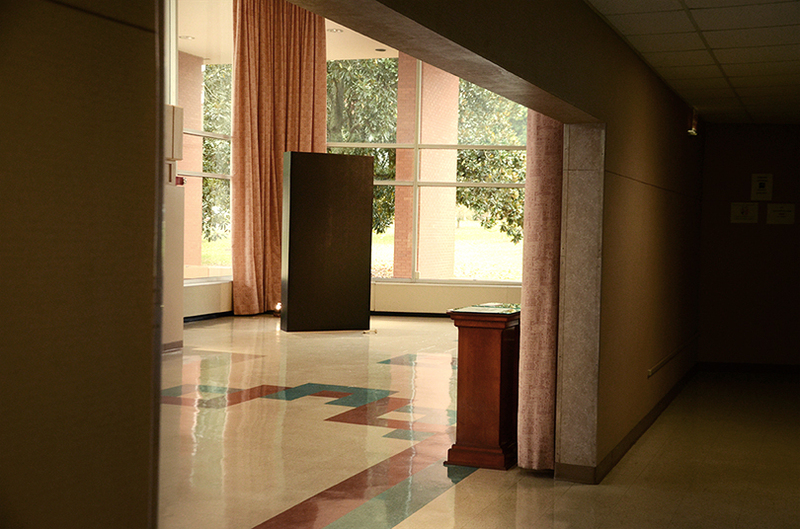 A similar object now looms in the Grover C. Maxwell Performing Arts Theatre’s front lobby. While the latter is a distinctly human construction — built by Larry Millard, professor emeritus in the Lamar Dodd School of Art at the University of Georgia, and Matthew Buzzell, professor of communication at Augusta University — the Maxwell Monolith is no less a gift. Like the structure it commemorates, it is a love letter from the past. A well wish to future generations. A reminder of wonders come and gone, and fates willing, those that might come later on. Millard and Buzzell built the thing for the Cinema Series’ Cinema ’68 celebration — a curated showing of some of the best movies released in 1968. “The best movie released that year” by Buzzell’s reckoning, 2001 graced silver screens for the first time just as Augusta was experiencing its own kind of evolutionary shift. The Maxwell Theatre opened its doors to the public in 1968. And like Kubrick’s tale of human evolution, the story of the Maxwell Theatre’s past is one best told out of sequence. Staring into a can of still, dark liquid, Millard struggles to hide his disappointment. It’s Thursday, Nov. 8. In a little over a week, the sculpture he and Buzzell have spent weeks perfecting will make its public debut in the Maxwell Theatre’s front lobby. A deluge of curious hands and flashing smartphone cameras will find it there in the coming days, dulling the sculpture’s semi-reflective surface to a wan and glassy sheen. For the moment, though, the thing lays bare in the Maxwell Theater’s shop, a blank wooden canvas suspended three feet above a cold cement floor. Millard is an artist with a workman’s sense. He doesn’t harbor illusions about the tools of his trade. Having once been offered a regional sales managers position for a chemical company, he understands paint, like any other chemical concoction, can be plied in different ways. Few of them effective. Using a simple roller and a precise series of movements, he smothers the monolith’s sleek white outer shell with the color of void before settling in for a long wait. That’s the key to a good paint job. “Behind every man now alive stand thirty ghosts, for that is the ratio by which the dead outnumber the living.” Adapted from Arthur C. Clarke’s novel of the same name, Kubrick’s 2001 is an artistic tour de force. In it, no image stands more starkly, or is remembered more vividly, than the image of the looming monolith. Paint, at its core, is a liquid with flakes of pigment in it. There are various paint formulas and components, of course. Binders. Solvents. Fillers. Things which novices overlook and about which masters obsess. Most paint consists of a liquid with flakes of pigment in it. When applied to a surface, those flakes bond together to create the uniform look of a paint job well done. The evaporation of the liquid medium is what sticks them to the surface. Thicker coats result in a larger fluid buildup, leading to a longer drying time. And a greater chance that something will go wrong. There’s a lesson there. Whether the project is painting an alien supercomputer or telling a simple story, Millard says, if you want a thing done right, you shouldn’t be afraid to take your time on it. The university owes an eternal debt of gratitude to Gov. Carl Sanders and First Lady Betty Foy Sanders. 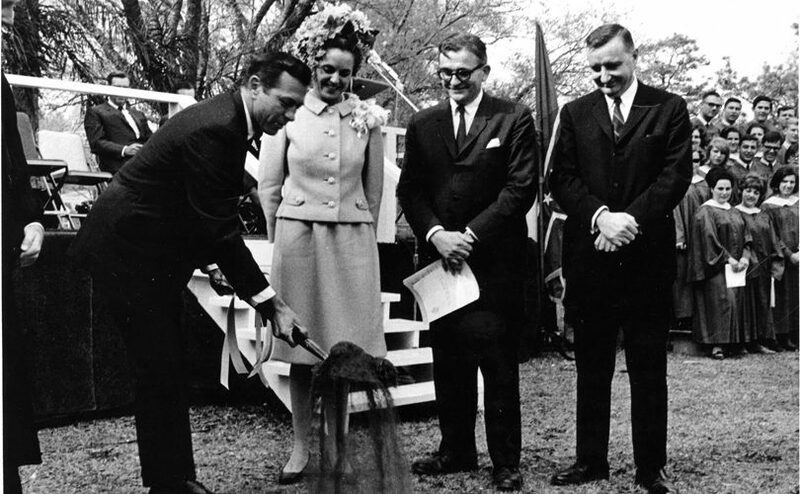 Seen here breaking ground on the future home of the Maxwell Theatre, the Sanders family was instrumental in bringing the arts to center stage locally. 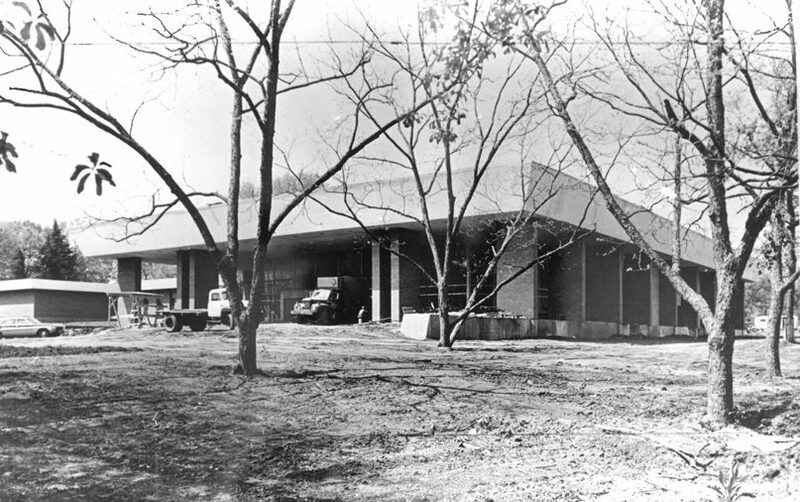 Prior to the Maxwell Theatre’s construction, there was no home for the arts at Augusta University. Student musical performances took place in local churches. Artwork was displayed in the college library. Plays, the few staged on campus, played out in the Chateau, the former Augusta Arsenal’s horse stable. In 1959, Gerald “Gerry” Robins, president of then Augusta College, wrote to the University System of Georgia’s Board of Regents to request funding for an auditorium to house the arts. Funding would not come in 1959, however. Nor would it come the next year, or the year after. Despite this delay, Robins, a former B-17 combat navigator, stayed the course. Augusta, he believed, deserved a center for the fine arts. So long as there was breath in his lungs, he would never stop fighting for one. Despite his determination, Robins and Augusta would wait another four years for word. Hope finally arrived in the form of another B-17 alumnus. In 1963, Augusta sent native son Carl Sanders, a former bomber pilot, to the governor’s mansion. 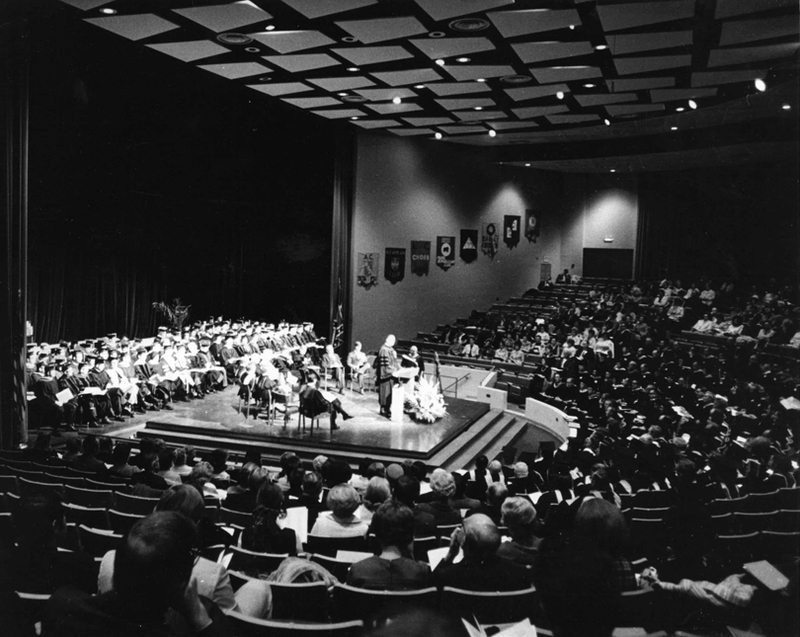 With his backing and the full support of the Board of Regents, Augusta College became a four-year-institution and secured funding in 1965 — $1 million (roughly $8 million in 2018) — for what would later come to be known as the Grover C. Maxwell Performing Arts Theatre. The Maxwell Theatre’s interior has changed very little in the last five decades. Its design is an enduring testament to its creators’ shared vision: a glorious, open auditorium and a home for the arts in Augusta. Coincidentally, the year Carl Sanders went to Atlanta was the same year renowned musician Harry Jacobs joined the university as chair of the burgeoning Fine Arts Department. His first task, per Robins’ request: Begin work on the design for a new auditorium. Jacobs took the directive to heart. 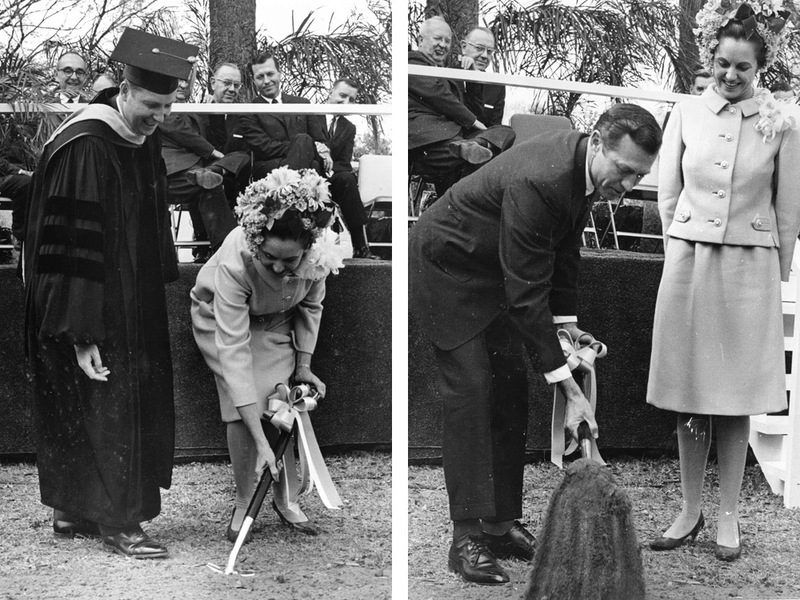 On March 30, 1966, Sanders and his wife, Betty Foy Sanders, visited Augusta College to break ground on a new performing arts theatre and accompanying fine arts center. Jacobs, alongside his faculty — his wife, Vola, pianist Artemesia Theavous, organist and choir director Emily Remington, artists Freeman Schoolcraft and Keith Cowling, and theatre professor Walter Guthrie —spent much of 1966 and 1967 planning with architects to bring Robins’ dream to life. That dream would be realized on the evening of Oct. 27, 1968. Surrounded by an exhibition of his wife’s work, Sanders stood before a packed house of community members, students and beaming faculty — including an ecstatic Robins and Jacobs — to deliver the promise that would define the Maxwell Theatre’s mission for the next half century. 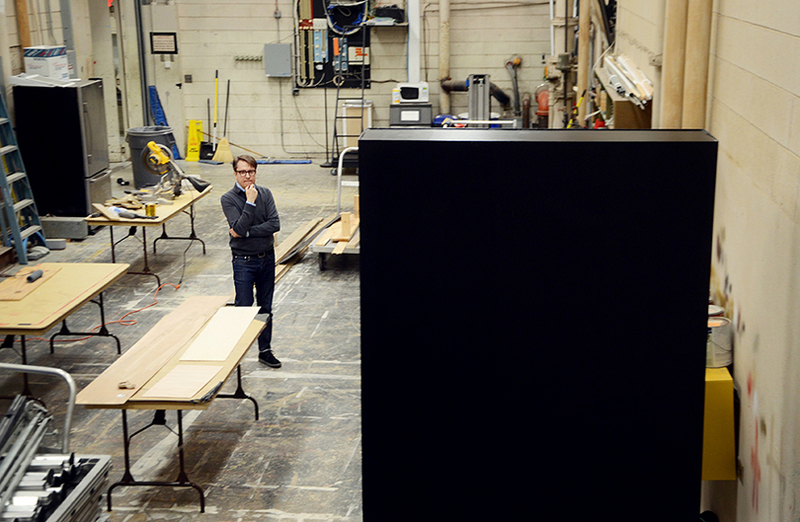 “Essentially, what we’re building is a black box.” Buzzell and Millard spent weeks perfecting their monolith ahead of November’s Cinema Series event. The Maxwell Theatre has seen a great many marvels in the last half century. A great many characters, too. Its lobby has witnessed the comings and goings of chancellors and governors. Its stage, the presence of Nobel Prize winners, lauded Civil Rights activists and at least one Rock and Roll Hall of Famer. Civil Rights legend Rep. John Lewis (R-Atlanta). Dith Pran, photojournalist and subject of the The Killing Fields, an Academy Award-winning film about the Cambodian genocide. Philippe Petit, the French daredevil who famously walked a high wire between the World Trade Center’s Twin Towers. On and on goes the list of high-profile personalities to visit the theater over the years. But those temporary visits, impressive as they are, are just that: temporary. The Maxwell Theatre’s true legacy is a construction of decades, a thing built brick-by-brick by the artists, educators and students at the heart of Augusta’s creative culture. Educators and students like Millard and Buzzell. “He’s been one of my favorite teachers,” Millard, a lifelong educator, says of his colleague. Wielding a belt sander, he stands between the finger-smooth boards of the monolith’s frame in the same chateau that once housed the university’s plays. The monolith’s debut is still weeks away at this point. Millard has not yet had the chance to lament the various shades of black unchosen or to wax poetic about the chemical properties of paint. But he has had time to consider his partner in crime. The two aren’t the first student-mentor duo to bond over an artistic endeavor at the Maxwell. In 1968, as the theater was opening its doors, artist Nathan Bindler joined the faculty of the Department of Fine Arts. An accomplished painter and sculptor, and principal violist in the Augusta Symphony Orchestra for more than a decade, he hoped to mark his retirement in 1980 with a tribute to Augusta College. He envisioned a marble sculpture. Something grand to commemorate the fine arts. But the funding never materialized. In 1986, Harry Jacobs suggested one of Bindler’s former students, Kathleen Girdler, construct the piece instead. Bindler, ready to pass the torch to a new generation, concurred. Of course, arguably no character holds more sway over the Maxwell Theatre’s legacy than the man who gave it his name. Born in 1887, Grover Cleveland Maxwell was the fourth of eight children born to Gilbert Maxwell and Mary Jeanette Grady in Dublin, North Carolina. Like his siblings, he grew up tending his family’s farm. Entrepreneurship ran like a river through the Maxwell line. Thomas Ruffin (T.R.) Maxwell, Grover’s first cousin once removed, moved to Augusta in 1888 to open what would later become a wildly successful chain of furniture stores. Gilbert Maxwell, Grover’s father, operated a farm supply store and a saw mill, and worked in the lumber and turpentine business. He was also the local postmaster. It was no surprise, then, when the family’s youngest ventured out to pursue their own business endeavors. Grover’s brother, Bertram Maxwell, moved to the Garden City in 1901. The first of Gilbert’s children to leave the family farm, he took up work with T. R. in Augusta before partnering with local businessman Algernon Morgan to establish Morgan and Maxwell Furniture in 1904. Robert Jefferson and Grover would join their brother in 1905 and 1907, respectively. Having bought out their partner, the three worked to open and operate a number of stores throughout the Southeast under the “Maxwell Brother’s Furniture” brand. The Maxwell family was, and remains, one of Augusta’s most civic-minded. Bertram donated land for a YMCA camp in Augusta. Robert Jefferson also had an interest in the Augusta YMCA, serving on its advisory board and as its president at one point. His home, known today as the Maxwell Alumni House, was given to Augusta College in 1975 as a bequest of his estate. Grover himself was one of the founders of Junior Achievement of Georgia, a state branch of Junior Achievement, the world’s largest youth development organization with a focus on financial literary and entrepreneurship. He also served on the President’s Advisory Council of the Medical College of Georgia and as chair of the Augusta College Foundation, contributing a significant sum to the college’s endowment fund. Maxwell’s wife, Corrie Mears Maxwell, unveiled the commemorative plaque on March 7, 1984. A multi-million-dollar renovation of the Fine Arts Center, built alongside the Maxwell, is planned for the winter. The move, like so many of Augusta University’s moves in the past five years, signals a coming shift. A new direction in continuous march toward progress. One day, perhaps, that new direction will be outdated. New paint, as Millard can attest, will one day fade, flake and peel. New floors, new walls, eventually warp and twist. 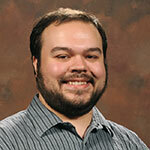 New faculty, staff and students, too, come and go, borne away to new places by new opportunities. Like the long-quiet echoes of speeches and plays gone by, one day, even the Maxwell Monolith will slip into the past. It, like the memories of the men who made it, will live on only in the perspectives it changes, in the ideas and conversations it inspires. When it does eventually fade, however, the structure it commemorates, the structure that houses it, will still be standing. The theater’s past, like its bright and hopeful future, call to mind the last words spoken by Commander David Bowman in Clarke’s original rendition of 2001.